I can't live without my computer. I love television, movies, and music. Long, hot showers on snowy, Minnesota mornings are a must. Growing up in the country a car was pretty much essential, and I love driving. I could beat any of you at Mario Kart and my dancing skills at Just Dance are getting better as the days go by. I love to cook and my friends love my barbeque meatballs. Lights are a necessity because I couldn't read without them. I'm a consumer of all of these things, but I know I'm not alone. Now venture with me to London, 2015. Consumers like myself are about to undertake strict carbon rationing to counter the effects of global warming. After the Great Storm of December 2010, where over 8,000 died, thousands of businesses were demolished, and billions of acres of agricultural land destroyed, the EU signed the Co2 Rationing Accord of 2012 which aimed to limit each person's carbon emissions by 60% by 2030. The United Kingdom decided to undertake the rationing by 2015, which is where we begin in Saci Lloyd's novel, The Carbon Diaries 2015. Living with her older sister, Kim, and her mother and father, who are, like almost every other adult in London, not taking rationing well, sixteen-year-old Laura Brown tells the story of 2015 through her diary entries and occasional drawings. All other stuff like clothes and technology and books have already got Carbon Points built into the price, so say you wanna buy a PC, but it's been shipped over from China and built using dirty fossil fuel, then you're gonna pay a lot more for it in Euros – cos you're paying for all the energy that's gone into making it. Things are strict in Laura's London. The whole premise of this novel is fascinating to me because I am a consumer of all the things I mentioned. Could I save enough carbon points to watch the latest Clooney film? Do I really think Patty Griffin's music is worth some carbon points? Could I really manage without a car? What would I do if I had to ration my carbon emissions to such an extreme? I hope I'd be more with it than the adults in Laura's life. 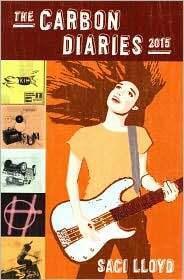 Like many other young adult novels, in Carbon Diaries teens are strong, bitter, and angry and adults are clueless. Laura's parents cry, bemoan the loss of using their car, and her dad turns into a lazy moron when he loses his job. Teens are much more levelheaded when it comes to carbon rationing, though Laura is mad she can't practice enough with her band, the dirty angels. But it’s more than just carbon rationing. Because of the storm of 2010 and the continuing effects of global warming, things aren't well in 2015. The winter is freezing and the summer is scorching. Storms continue to be extremely disastrous. Riots break out across the country when even stricter rationing on heat, gas, and water need to be enforced. And Kim's black market carbon deals aren't helping. Saci Lloyd makes all of this appear plausible. All of the arguments, issues, problems, and situations that happen because of carbon rationing seem like they could happen. Of course there would be riots and black market deals. Of course some people would go crazy and supplies would run out. Everything that happens really feels like it could if it gets to this point. Overall this is a great story. Sometimes adults are painted as goofy caricatures and Laura’s voice gets a little whiny and bitter, but the story is strong enough to overlook these things. I’m also happy to know that it doesn’t end here. The Carbon Diaries 2017 is on my bookshelf waiting for me.